Based on the true story of legendary mob infiltrator Joseph Pistone, Donnie Brasco is a gritty journey into the belly of the Mafia. Al Pacino and Johnny Depp are captivating as the entrails of an organization at war with itself are revealed in bloody detail. 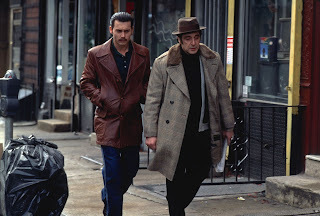 Posing as a shady jewel trader in the grimy New York City of the 1970s, FBI agent Pistone, operating under the alias Donnie Brasco (Depp), attracts the attention of Ben "Lefty" Ruggiero (Pacino). A low level but respected hit-man in the crew commanded by Dominick "Sonny Black" Napolitano (Michael Madsen), Lefty has always been passed over for promotions within the mob's hierarchy. With his own son a drug addicted failure, Lefty takes Donnie under his wing, introducing him to the family as a trusted associate. Donnie gains the confidence of the various mob operatives in Sonny Black's crew, including Nicky Santora (Bruno Kirby). But as Pistone burrows deeper into the Mafia, his personal life begins to feel the strain, with his wife Maggie (Anne Heche) effectively leading the life of a widow, never knowing where her husband is. Meanwhile, Sonny Black gives Donnie increasing responsibilities, including running a club in Miami, and Lefty realizes with growing resentment that his protege has surpassed him in influence. When an internal mob war erupts, Donnie finds himself at the hot end of the hostilities, and his FBI handlers have to find a way to pull him out before he kills or gets killed. The script by Paul Attanasio, adapting Pistone's book, takes some artistic liberties, but in general Donnie Brasco recaptures the grim reality of the FBI's most successful mob infiltration. The six years that Pistone spent undercover resulted in over 100 convictions, and the film provides an immersive lesson on life within a criminal enterprise. While some drag creeps into the second half of the story, with a vaguely unsatisfying highlight reel composition taking hold, the raw power of the events and the central performances help pull the movie through. The New York City of the 1970s is always fertile ground for rampant criminality wedded to resignation, and director Mike Newell ensures that the clothes, cars, locales and dialogue do nothing to alleviate the overbearing sense of crime as routine business. "Fogettaboutit" is the most common phrase exchanged within Lefty's circles, and as Donnie explains in one humorous scene, it can mean anything, depending on the exact pronunciation. Al Pacino and Johnny Depp both deliver hypnotic performances. 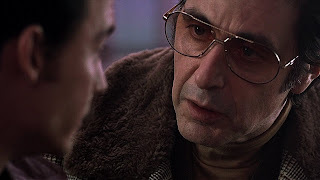 Pacino's Lefty is a man looking in the rear view mirror at what might have been, holding on to a bit of pride but fully aware that his chance at glory, if he ever had one, has long since passed. With an economy of movement but a defiant face ready to switch from aggressive to aggrieved in an instant, Pacino effortlessly succeeds in making a multiple killer sympathetic. Depp matches Pacino, as Donnie walks a tightrope between outwardly respecting Lefty while he comprehensively betrays him. Depp exudes a cool confidence mixed with just enough of a propensity for violence for Donnie to gain the confidence of Lefty and then Sonny Black, as he worms his way into the mob's business and ever deeper into an alternate reality. Depp's achievement is a masterful portrayal of a man whose mind is always racing ahead of the events surrounding him, since he is only ever one mistake away from death. Donnie Brasco is a worthy addition to the long list of mob crime dramas, with the added shine of real people and events serving as the basis for a gripping narrative. Fogettaboutit? Not likely.